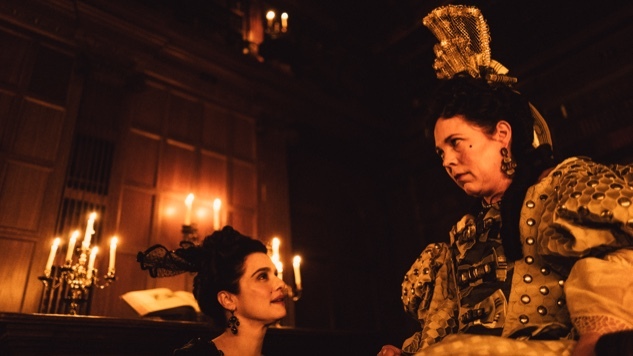 The Lobster and The Killing of a Sacred Deer director Yorgos Lanthimos’ latest, The Favourite, just made its North American premiere on Sunday at the Telluride Film Festival, and Tuesday brings the official trailer for the oddball Greek director’s awards contender. We got an enigmatic teaser trailer for the film back in July, but the full trailer sets forth The Favourite’s central trio: Lady Sarah (Rachel Weisz) and her cousin Abigail (Emma Stone), two women scheming to get into the good graces of “mad” Queen Anne (Olivia Colman). Abigail arrives as a new servant in the court, hoping to unseat her cousin as the Queen’s favored companion, launching a return to her aristocratic roots. The new trailer sets up three compelling lead female performances in Colman’s Queen and her two hopeful companions, an enviable problem for Fox Searchlight to have in terms of awards strategy. Colman is set to take over in the role of another English royal, Queen Elizabeth II, in the forthcoming third season of Netflix’s The Crown, and Weisz and Stone are already Oscar winners. This dark comedic take on the court drama, set in early 18th-century England during wartime with France, might also be the most accessible work to date from Lanthimos, whose Dogtooth and The Lobster picked up Oscar nominations. Fox Searchlight will release The Favourite in select theaters Nov. 23. Watch the trailer and check out a new poster below.